A bimetallic thermometer relies on the deformation of a bimetal spring or strip in response to a given temperature. The mechanical deformation is transformed into rotational movement of the indicating needle on the instrument face, where the corresponding temperature can be read by a technician or operator. This design principle has been in use throughout laboratories, kitchens, and industry for many years and has proven to be predictably accurate, stable, and rugged. The major advantages of the bimetallic thermometer are its relative cost, ease of use, and ability to function without any power source. While this class of instruments provides operability up to +1000°F, the operating principle does not tend to provide similar accuracy at very low temperatures. 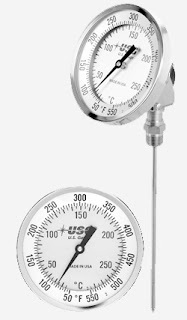 When applying dial faced thermometers, the main considerations beyond selecting the appropriate temperature range are the diameter of the dial and the mounting arrangement. US Gauge, an Ametek brand, provides a line of bimetallic thermometers for industrial process applications with a large degree of built-in flexibility to make selection and installation very simple. Three and five inch dial faces are offered, along with a selection of temperature ranges and stem lengths. The stem can be adjusted to almost any angle to provide good view of the face, and the head can be rotated over 180°. Provided just below is a data sheet and description of the ADJ Series from US Gauge. Share your instrumentation challenges with the product application experts at Miller Energy. Combine your process knowledge with their product expertise and develop the the best solutions. Industrial Bimetallic Thermometers: 3 and 5 Inch Adjustable Angle from Miller Energy, Inc.
Industrial environments present a wide range of challenges to the process designer or operator looking to install sensitive instrumentation or controls. Not all devices come with integrated enclosures suitable for all environments. The responsibility for properly housing equipment, controllers, and other instruments can fall on the process designer or operator. There are numerous considerations in the design and selection of an enclosure, especially when the application drifts beyond the range of commonly available sizes, configurations, and materials of construction. Here are some thinking points for you. Ignition Hazard Level: Areas or locations with hazardous classifications will require special enclosure designs and features for compliance. Climate: If outdoors, consider the range of local weather conditions and their potential impact on the longevity and performance of the enclosure, its ability to protect whatever is housed within. Access: Do operators need quick access to contained equipment? If so, appropriate latches or other closures that allow interior access without a need for tools may be in order. Security concerns may warrant locking capability. A clear panel installed in a door can provide visual access to instruments safely contained within the enclosure. Corrosion: Wet environments or locations near seawater or other corrosive elements can call for upgraded coatings or materials of construction that will prolong the useful life of the enclosure. 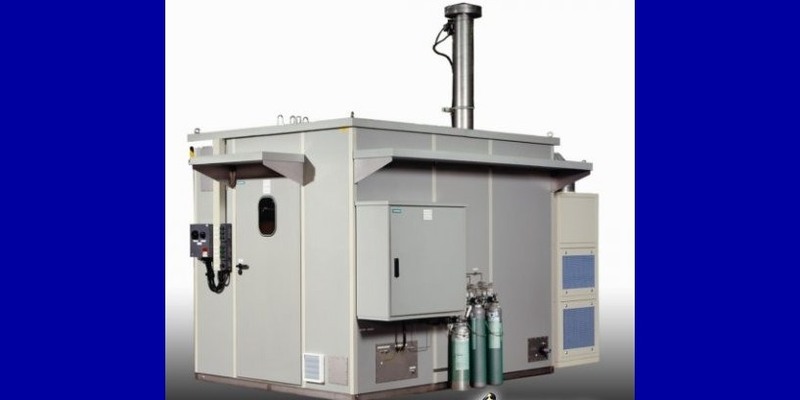 Enclosure Cooling or Heating: Depending upon the surrounding temperature or the characteristics of equipment housed in the enclosure, heat removal or supplementing accessories may be integrated into the enclosure design. Size: Consideration given to possible additions to the original array of instruments or devices to be contained can save substantial time and money if a future expansion is in order. The size of the enclosure should provide for any clearance recommended by device manufacturers for their installed components. Provide adequate servicing space for field technicians to perform any necessary tasks related to housed equipment. Penetrations: Conduit or other penetrations required for proper operation and installation can be accomplished more precisely, and often at a lower cost, in the factory than in the field. Carefully laying out and coordinating the installation of connections to the enclosure can save time and trouble in the field. Certainly, there are numerous other elements of enclosure design that may be taken into account for differing installation requirements. Share your project requirements with application specialists and reach the best solutions by combining your process knowledge with their product expertise. Safety implementation typically is accomplished by a group that includes plant instrument engineers and technicians. They are charged with developing simple and reliable solutions that increase safety and reduce risk. Safety related events can involve the question of when to shut a process down. These decisions can hinge on the level of key process variables such as flow, level, temperature and pressure. All must be within their specified range at various locations throughout the process, whether within chemical and petrochemical plants, refineries and power plants, or other processing operations. Critical points of measurement can include anything from process vessels to eye wash stations. United Electric Controls has authored a white paper entitled "Simplifying Plant Safety Instrumentation" that provides some insight into deployment of safety controls. The entire white paper is included below and will prove to be useful reading. More detailed product and application information is available from product specialists. Combining their product expertise with your process knowledge will produce the best solutions. 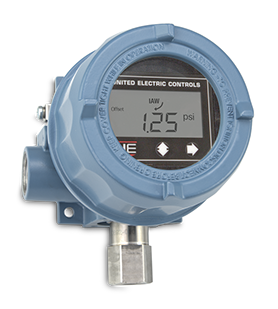 Simplifying Plant Safety Instrumentation from Miller Energy, Inc.